No doubt, like me, you have the best of intentions when you are at the market. All that gorgeous produce in all their vibrant colors and alluring fragrances can be too much to pass up. So you buy. And buy. And buy. You put the veggies away in the bins in the fridge and set out the fruit on the counter to ripen. And you forget about them. Or you accept too many dinner invitations. Or you just overbought and can't keep up. But time passes and what was once bursting with freshness and seduction is now just this close to becoming garbage. Of course, you want to prevent that to begin with, but if you somehow let that produce go beyond nature's expiration date there are ways to save it before it's time to toss. Veggies can go into soup or a sauce or undergo roasting. And, the same with fruit, too. Puree strawberries (which have virtually no grace period), add them to a smoothie, or make jam or sorbet. Turn blueberries into a granita. 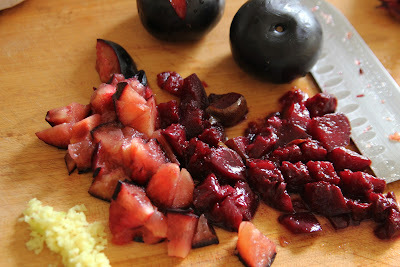 And, as I did recently, rescue über soft plums and pluots and make a savory compote. Those plums. Oh, they were delicious when fresh. Dribble down the chin juicy with a hint of crunch. Sweet yet tart. But, then I had a spell of outings and there they sat, waiting--fruitlessly--for me to remember they were there. They softened. They sank. And then finally when they caught my eye again they no longer held any attraction and I tried to ignore them. But there was no ignoring them and since I had some free time--and a gorgeous Berkshire pork chop I planned to make for dinner--it occurred to me that I could work their sad state to my advantage and turn them into compote. Plums and pluots have plenty of natural pectin so they are perfect for jamming and for compote. 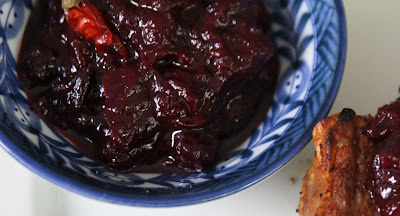 Since I only had half a dozen pieces of fruit to work with, I decided on the compote as a perfect accompaniment for the pork chop and in about an hour and a half had a gorgeous purple sauce at the ready. The process is simple. You'll sauté shallots and garlic until they're translucent, add a little wine--in my case, Madeira--and reduce it, then add the plums and the rest of the ingredients. Simmer slowly, stirring periodically, and the liquids will gradually evaporate, leaving you with a deeply rich perfumed sauce that complements pork, chicken, and duck. In a stainless steel saucepan, add olive oil and heat. When warm, add shallots and garlic. Sweat them until they're translucent. Add the Madeira and simmer until it disappears. Add the plums and the rest of the the ingredients and stir to mix. Slowly and gently simmer until the mixture reduces and thickens until jammy--stirring occasionally. It should take about an hour. Discard the cinnamon stick and red chile. 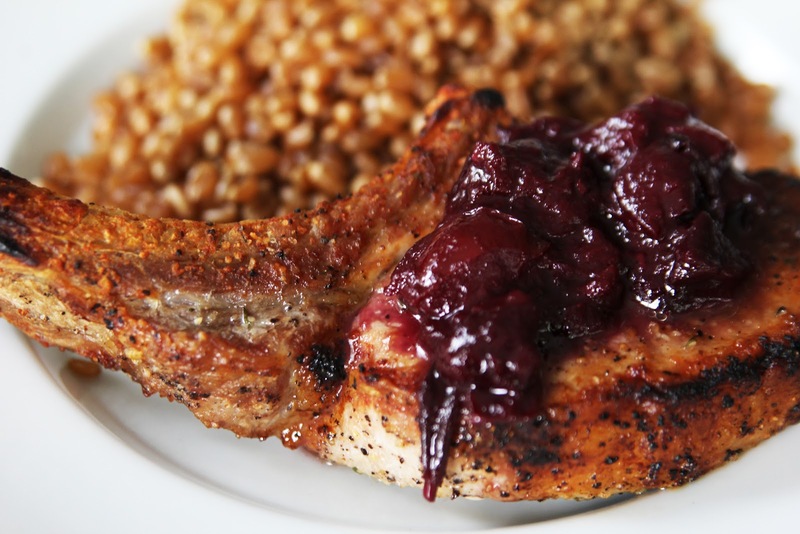 Serve as a sauce with pork, chicken, or duck.